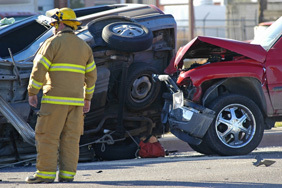 Please visit our “Auto Accidents” or “Truck Accidents” pages for advice if you think you have a case. Middle-aged woman was killed on her bicycle when a tractor-trailer driver violated her right-of- way, leaving her two adult daughters. Settlement for a man who sustained head injuries in an auto truck accident in Los Banos, California. The trucker failed to operate his rig in a safe fashion causing it to strike an automobile. The man suffered multiple head injury defects including memory loss, inability to concentrate or multi-task. 39-year-old man who suffered a back injury in a car crash resulting in an L4-5 fusion surgery. Settlement against PG&E and the county of Santa Cruz for injuries sustained by a man and woman when their car struck a utility pole in Watsonville. The pole had been placed in an unsafe position near the roadway where it was foreseeable that a vehicle could strike it. Settlement for a man injured in a head-on collision in Santa Cruz County. The at-fault driver lost control of his vehicle while driving in the rain. $1.02 million settlement Settlement for a couple who were involved in a high-speed automobile accident with a newspaper carrier. The force of the accident caused the wife to lose her 8 month old fetus. Settlement for 55 year old man who suffered a closed head injury in an automobile accident. Settlement on the first day of trial for a man who was severely injured while working for Davy Tree Company. The large tree cutting truck had a brake repair job done a day before. During the brake repair job the mechanic put in the brakes backwards which resulted in all of the brake fluid leaking out of the truck. As the truck came down a steep hill after doing a job, the driver lost the brakes and the victim had to jump out of the truck while it was careening out of control down a hill, suffering major injuries. Settlement for a woman who lost her leg in an automobile accident. A defendant driver negligently stuck the passenger side of the vehicle after running a stop sign. Verdict against a King City Trucking Company for head injuries sustained by a woman in an auto/truck accident on Highway 101 in Monterey, California. The trucker had jack-knifed his rig across the highway at night without adequate reflectors on the truck. Settlement for a woman who was injured by a junior high school principal on her way home from work. Although the principal was on her way home, the School District accepted responsibility for the accident. Settlement with Burger King in Capitola, CA for a young boy who was injured in the parking lot. A trucker got impatient with traffic on 41st Avenue and tried to cut through the Burger King parking lot to get to his destination. In his rush the trucker failed to see a young boy crossing the parking lot. The young boy suffered major injuries which were complicated by the fact that he was a hemophiliac. A drywaller was on his way back to his employer’s construction yard when another commercial truck lost control of his vehicle while exiting I-880. The defendant struck the plaintiff head-on causing a low back injury which resulted in an artificial disk having to be put in the low back. Plaintiff had to be retrained to do different work than drywall because of his injuries.